I am in this stage of life where I am really trying to hammer down what God is calling me to. This book really helped me see what God is truly calling me to. 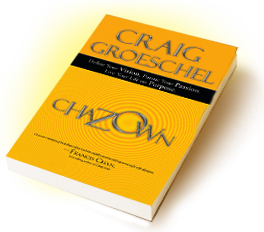 I have always loved Craig Groeschel and this book helped me see that God has a vision and a calling for my life. I enjoyed this very much and will hand it out to my students in the youth ministry whenever they reach high school. I have wanted to start handing out books to them each and this one will definitely make it upon that list. This week taught me a lot. It taught me that no matter what goes wrong in a service (and believe me, everything that could have broke, broke or messed up – band started in different keys, monitors messed up, pastor’s mic went out, back up mic cable didn’t work, no recording for the week, pen broke on the computer, etc…) but God used it. I have had more comments about God moving in this service than I have since starting with 24/7. God is good. As I tweeted earlier, God is perfectly sufficient, no matter what we do. There was no new recording this week, but please check out the previous messages in our Matters of the Heart series here. To help welcome people to our church, we also added a new element to our services at the very beginning so that we can either introduce or familiarize others with. Amy Poehler did the commencement speech for Harvard this year. They always get the best people. The lady who did my graduation speech made me fall asleep and never wish graduation upon anyone else. Only one video this week. Not because of lack of content but because I was so busy that I didn’t get to enjoy many of them. But I did hear that you can now watch Kevin Smith’s movies on Hulu. He was my one of my favorite filmakers growing up. His films are hilarious and they really make you think even though you have to endure tons of curse words and very suggestive language. 15 killer offices in a tech company. Interview with Billy Graham. One of the heroes of the faith being interviewed by Christianity Today. Good review of Rob Bell’s newest book. I think I am done reading reviews about his book. I believe I have read like 10 of them now. The worst parade of all. Jon Acuff is quickly become my favorite blogger. Probably because he has twonow. This post was really good and inspiring. Also, read his book Quitter if you want to be inspired. Favorite of the year for me so far. Here‘s why the Whittaker love astounds me. Carlos Whittaker is a rockstar. He starts movements everywhere he goes. He was in Cali, then serving with Andy Stanley, Catalyst, Integrity, etc… but through it all, he is a blogger at the best blog on the Christian planet. But he is a family man first and foremost and that is what astounds me about him most. This is a good wedding video that I would watch even though I have yet to meet either person. We had a great service this past weekend. We continued our series, Matters of the Heart, and Pastor Tim shared with us on the issue of judgment. If you would like to listen to it, here is our media player (where you can listen to this messages or previous ones).